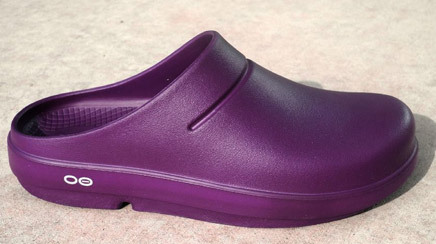 Oofos is a new footwear brand featuring a proprietary material called Oofoam that has unique energy absorption capability. Oofos is a new footwear brand featuring a proprietary material called Oofoam that has unique energy absorption capability. The company asked AOR for PR True North Brand Group to help develop a campaign to build brand awareness and drive sales. The team drove product trial and messaging at trade shows and expos through blogger and media outreach and giveaways, and on Oofos' social media properties. Retailers and athletes experienced the shoes and learned about the technology at eight total trade shows, expos, and events, including the Outdoor Retailer show, the Surf Expo, the Yoga Journal conference, and the Boston Marathon. “We photographed what we call the ‘Ooface,' which is the look people make when they try on the shoes, posted the pictures in our booth, and gave away shoes and additional prizes for the best ‘Ooface,'” Tedeschi notes. Giveaways with mom and fitness bloggers began in May. Fitness and outdoor trade media and bloggers were targeted beginning in July, and consumer-focused outreach began in August. Select women's and men's consumer, yoga, and running traditional media outlets got product for holiday giveaways, as did select bloggers focused on yoga and running. Regular posts on Oofos' Facebook and Twitter page highlighted consumer experience with the shoes, promoted blogger giveaways, and drove the recovery message. Pinterest boards were created for multiple target markets, including surfing and tennis. Retail business increased from about 260 stores in May to more than 400. The campaign garnered 14 traditional media stories and 200 blog posts. Outlets covering the story included Footwear News, Elevation Outdoors, and Women's Adventure. Followers on Facebook, Twitter, and Pinterest combined climbed from 4,000 to nearly 11,000. Outreach to various athletic markets is ongoing. Spring and summer targets will include mainstream general interest traditional media outlets.